Here's one of them, before I damaged her. Thanks to Bruce Perkins for the beautiful photos. May God grant you blue skies aloft, With winds of calm by land, As you play on the outskirts of heaven, On the fragile wings of man. All good, thanks for the correction. The one in WC, is that the one based at FAWC? It was at the Delta 200 airstrip. Got as far as being started , and taxiing, but never flew. Proof? Looks like a typical Cape veld fire! Every dog needs a home and every home needs a dog (or two or three). I was tipped off to the raid the cops did on the premises where these aircraft were stored, near Northgate Mall, Randburg. I took a bunch of pics of the Keystone Cops at work with the aircraft and armamaments! Wonder what happened to those F-86 fuselages, wouldn't mind getting my hands on one of those! All of this was absolute nonsense I think as the necessary import and other permits had been obtained so the raid and the aftermath was simply political grandstanding by the corrupt and ineffectual Selibi and SAPS! Then it must be the same one ... I took that photo at Delta 200 (YPT Aerospace). I Saw fairy Firefly's at Duxford a few years back being unloaded from crates !! I spend several days a month at the D200 airfield(skydiving and/or flying), and have done so since early 2000. 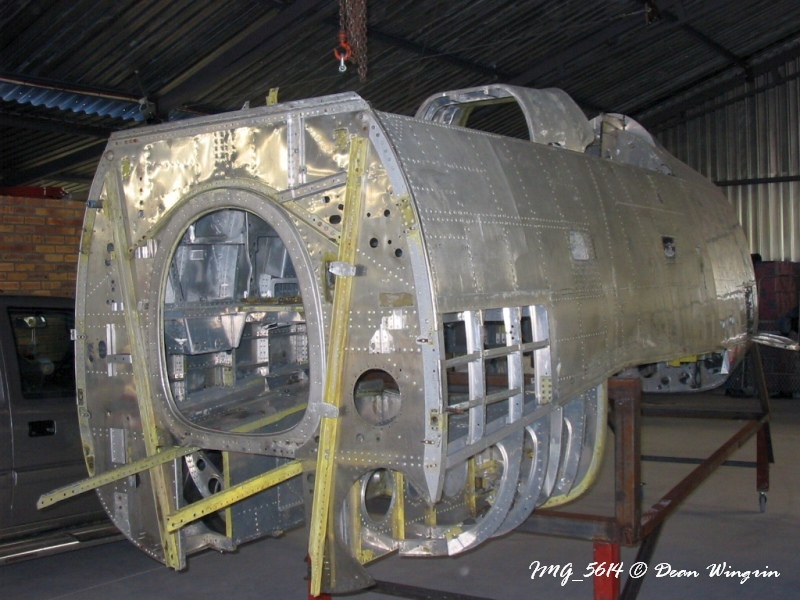 As far as I can recall, when the hangar and T28 package arrived from Lanseria area, there were several fuselages/wings in various states of repair. Some still had faded, I'm guessing EAF, paint and markings, some were partially stripped, and one or two as your example. I may be wrong (halfzeimers ) but I seem to remember that a set of wings, and one fuselage, were already painted that red/white. I believe the previous owner up Lanseria way had apparently already got that one rebuild 50% plus along before selling to the YPT guy, Andrew Baldwin. YPT obviously first tackled/continued with that one. It was interesting to see the progress achieved, but the initial steady pace later slowed, and then only continued in fits and starts. As mentioned, the A/C got as far as taxiing, but not flying. The rebuild project ground to a complete halt several years back. It would now appear everything is being packed into containers in preparation for the next stage of the journey. There are a few threads on AvCom giving more details and pics. of the historical progress. In Umhlanga Rocks, there is a Spar called Park Square. Hanging above the entrance is one of the SAAB Safir's . I am sure it comes out of the batch.